Today I'm showing you a Christmas party look I came up with and it's build around the sequins beany I have on. This outfit is really simple, I just wanted to wear something sparkly and since don't own other sparkly things I decided that the beany will work too. For the rest of the outfit I chose the classic black colour. 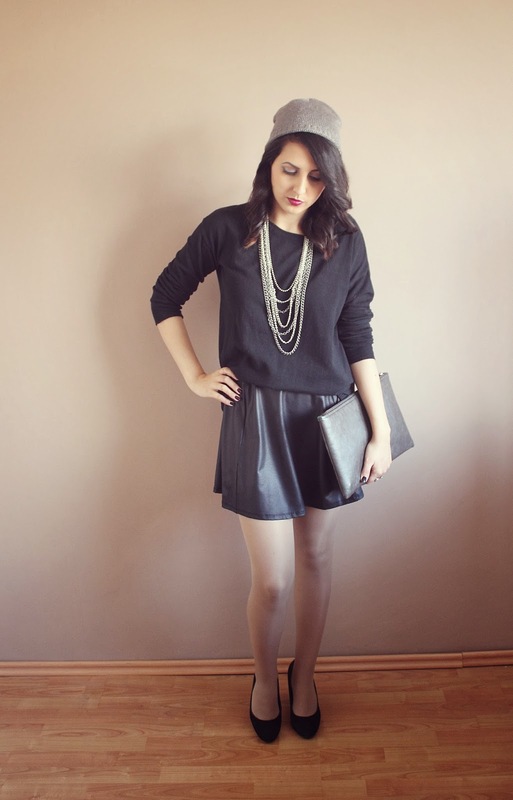 I wore my pleather skirt, a simple black sweater and my black high heels. For accessories I decided to go with this chain necklace and I think it brings some edge to the look. For bag I chose a simple grey envelope bag. To complete to whole look I'm wearing dark plum lipstick and on my eyes I have sparkly silver eyeshadow and winged black eyeliner. This post is collaboration with other beauty and fashion bloggers and we do this thanks to KristieBlogsBeauty. Tomorrow on her blog you can see her holiday inspired post and also the links to the others bloggers posts. They are all about hair, make up, nails and outfits for the holiday season. beau 21 декември 2013 г., 12:38 ч.
ina Love 21 декември 2013 г., 15:09 ч. ... 21 декември 2013 г., 20:10 ч.
Lilly 22 декември 2013 г., 6:54 ч.
I'm following you now, maybe you can follow me back :) i'm starting a new blog! ... 22 декември 2013 г., 12:35 ч.
Viktoria 22 декември 2013 г., 15:08 ч.
elena vasilevska 22 декември 2013 г., 16:02 ч.
a 14 year old with a camera 22 декември 2013 г., 17:41 ч.
Yulia Sidorenko 22 декември 2013 г., 23:16 ч.
Carolyn 23 декември 2013 г., 8:42 ч. You look so beautiful and xmassy! Margaret Cruzemark 26 декември 2013 г., 16:09 ч.